This is my first layout. It will be prototype freelanced, modern era CSX. Just a Single mainline, a passing siding, and a few spurs. Bench work is modular for easy expandability and moving to a new location. It rolls on caster wheels for easy access to the hidden track, that\'s under a hollow hillside. The layout is 11.5\' X 6.5\' and uses Atlas code 65 track. Most of visible mainline uses 15.5" radius curves, sharper curves hidden under hillside. I will also add a river and 2 bridges. The backdrop will be attached to the wall at a later time. That\'s all for now, will post more as progress continues. Comments welcome. Looks like a good plan for a first layout Lou. My only suggestion is to put in another passing siding or two. Right now you can only run 1 train at a time. This layout is DC for now, no blocks. But when I change over to DCC I will probably add a passing siding/staging track in the rear. Looks like a good start to me. Nice work so far. Looking like a fun first layout Lou. You mention a tunnel, any chance you can sketch on the plan where that will be? Here are some pics. By placing the tunnels at the beginning of curves, or completely covering the curves, it helps eliminate the roundy round effect. It looks like a fine plan, with a lot of room for modifications or additions as you go along. You have a quality looking bench work and base to work on as well. A good way to start! 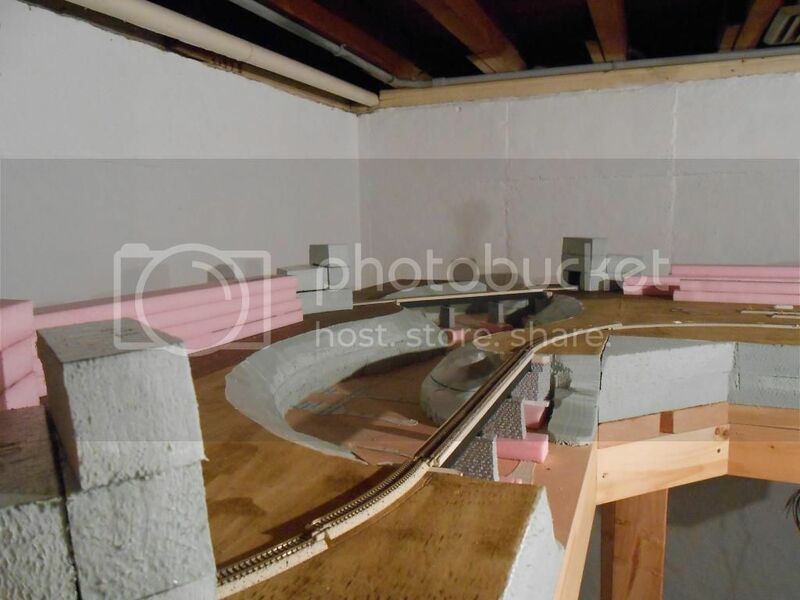 The rear of the layout/hillside will be left hollow, so with the bench work on caster wheels, just slide it away from the wall. Is it too late to add a double main line???!!! \nLooks great, will be watching this plan take effect, so hurray up and keep updating!! \r\nLooks great, will be watching this plan take effect, so hurray up and keep updating!! My initial plan was to have a double mainline, but since I am using sectional track, I was concerned about future electrical conductivity problems. The layout is being built on 2.5 modules, bolted together (see pic). I plan to re-use all material in a larger future layout. So CSXAL v.2.0 just might be a double mainline, but with feeders soldered to each piece of flex track. You are doing some nice work. Going to be a nice first layout. Here\'s an update to the CSXAL. I cut and installed some fascia/profile board and stacked some foam, keeping the rear of the hillside hollow for track maintenance. Note how the top of the tunnel liner comes off for easy track cleaning. Before you know you will be running some trains. Good for you that you are planning ahead for access. Looks great. As you can see in the pics the bench work rolls on caster wheels, giving me room to work. I will screw 1X4 to the wall and then attach a 2\' high backdrop. As I said in a previous post American ingenuity hard at work. Glad to see another True Track user, looks like a fine plan to me, and you already have the overhead lighting installed too. Are you planning on ballasting the True Track?.. Keep us posted on your progress. Thanks for sharing. Yes I am going to ballast. WS light gray fine ballast is a close match to the True Track roadbed. With the code 65 close tie spacing, very little ballast is needed between the rails, less problems at the turnouts. Looking very good Lou. You\'ve made a lot of progress. Very nice work. That some really nice work Lou, you are making fast progress, keep the pictures coming. \nI would suggest a long plank between the sets of legs in the bottom, so that there is also some support on the longitudinal section in the bottom. Nice work, coming along well. Looking really good Lou, I love how deep the river is, going to be very eye catching when done. That looks great, Lou. It will be a dramatic scene. Thanks for the positive feedback guy\'s. The river scene is the scenic highlight of my layout, and I\'m glad you noticed my attempt at creating a dramatic vista, even at this early construction phase without any scenery. This is my first layout. It will be prototype freelanced, modern era CSX. Just a Single mainline, a passing siding, and a few spurs. Bench work is modular for easy expandability and moving to a new location. It rolls on caster wheels for easy access to the hidden track, that's under a hollow hillside. The layout is 11.5' X 6.5' and uses Atlas code 65 track. Most of visible mainline uses 15.5" radius curves, sharper curves hidden under hillside. I will also add a river and 2 bridges. The backdrop will be attached to the wall at a later time. That's all for now, will post more as progress continues. Comments welcome. Last edited by Team DTO : 10-07-2018 at 08:48 AM.